Me listening to the new version of "Nunca es Suficiente" by Natalia LaFourcade and Los Ángeles Azules!! Please LIKE, SHARE, COMMENT & SUBSCRIBE!!!! Copyright Disclaimer under Section 107 of the Copyright Act 1976, allowance is made for "fair use" for purposes such as criticism, comment, news reporting, teaching, scholarship, and research. Fair use is a use permitted by copyright statute that might otherwise be infringing. Non-profit, educational or personal use tips the balance in favor of fair use. I do not own the rights of the music. All audio and visual parts are the sole property of their respective owners. This video is purely for entertainment and recreational purposes. No Copyright infringement intended! All rights go to its rightful owners. 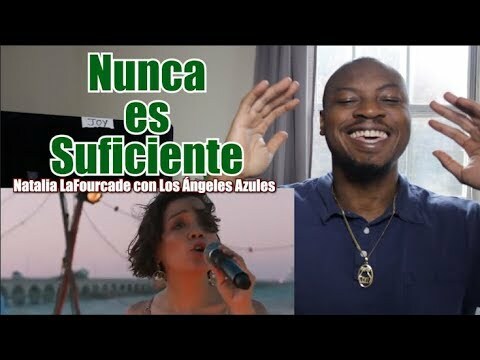 bien amigo te la rifaste con tu español ya quisieramos muchos mexicanos yegar al nivel de ingles, y de la cancion ni hablar es mucha pieza, y ya me suscribi y te di mi like, orale.my frend. Hey hey hey spanish Speaker Take it easy!! Nice your Chanel Pd: Your spanish is better dude, congrats !! bro' you gotta listen to natalia laforcade singing with juan gabriel.. that one song they did together is at a whole nother lvl! Saludos my friend from playa del carmen quintana roo. KING HERMANO, YA ERES MEXICANO !!! Me late que intente hablar español, vientos. que voz de esta mujer!